LED or Low Level Light Therapy (LLLT) is clinically proven to be safe, and has achieved ‘no significant risk status’ for human trials by the FDA. As such, your Celluma panel is a very powerful addition to your Esthetics tool box. First, clarify with your client that there are no contraindications for use. Once you discuss the treatment with your client, and obtain any necessary written consent from your clients’ physician, have fun with it! There are so many different ways to use your Celluma panel, and there are very few WRONG ways to use it! Extractions when indicated. LED will help destroy P. acnes bacteria for your acne clients, as well as reduce erythema and edema. You can also follow a face wax with 5 – 15 minutes of Celluma on the RED setting to reduce redness and inflammation. Make sure you remove any post-wax oils or lotions to ensure the light is not reflected or refracted (‘bent’), thereby reducing the effectiveness of the LED. You can also use LED Therapy with other modalities! Chemical Peels: First of all – contact the specific peel company you are using to see what their LED protocols are. If they do not have a specific protocol, here is a general guide. Apply prior to chemical peel, or 24-48 hours after for a superficial peel. After a medium depth peel, wait at least 72 hours unless directed otherwise by a physician. If using a ‘very superficial peeling agent’ you can use LED immediately following the treatment as long as the peeling agent has been completely neutralized. Check with the manufacturer of the peeling agent to confirm that the product is categorized as ‘very superficial’ as determined by the pH level and the percentage of active ingredients. CAUTION: DO NOT APPLY LED THERAPY AFTER A PEEL ON THE SAME DAY, UNLESS THE ABOVE MENTIONED IS THE CASE, OR A PHYSICIAN HAS GIVEN DIRECTION TO DO SO! IPL & RF (Radio Frequency): Use LED therapy prior to, or 24-48 hours after IPL is performed due to LED’s mild thermal effect (due to circuit board components) unless directed by a physician. 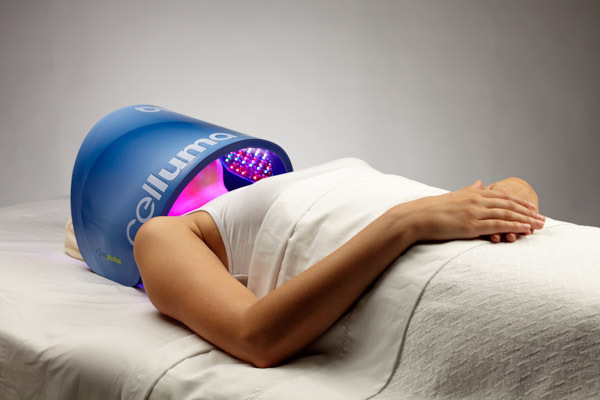 Incorporating LED therapy will increase anti-aging and skin rejuvenation benefits. Microdermabrasion & Dermaplaning: Apply LED immediately after to promote healing and for anti-aging benefits. Follow with serums, moisturizer and SPF. ThermoClear or similar electrodessication device: When treating cherry angiomas, spider capillaries, skin tags or keratosis / fibromas, you can apply LED immediately after to promote healing and for anti-aging benefits. If you are treating hyperpigmentation, wait at least 24 hours before treating. It is not recommended to apply any additional products after a ThermoClear treatment until 24 hours following the procedure. MARKETING SUGGESTION: Build the cost of the LED treatment into the IPL, RF or Microdermabrasion series to encourage client return for follow-up treatment with LED. LED will greatly benefit your client, and will reduce healing times! Microcurrent: Use prior to or following microcurrent treamtent for additional anti-aging benefits and improvement of skin conditions. Apply serums, moisturizer and SPF after treatment. Skin Spatula or Ultrasonic Spatula: After using skin spatula for exfoliation, and before using for product penetration, you can apply LED for additional anti-aging benefits. Microneedling: Apply before microneedling for additional anti-aging benefits, or the next day for additional benefits and faster healing. NOTE: Use LED BEFORE microneedling treatment for best results, as the serums used during microneedling may inhibit some penetration of light. Using immediately following microneedling will have healing and anti-aging benefits, but effects may be decreased due to serums using in the treatment. Also, treating the next day as a follow-up would greatly benefit the client, and facilitate healing. Laser Liposuction: Use as directed by physician to expedite healing and minimize bruising. Always follow physician’s recommendation. Laser Resurfacing: Use prior to resurfacing to prepare the skin and reduce signs of aging. Use after resurfacing as directed by physician to facilitate healing, reduce healing time and increase anti-aging and skin rejuvenation benefits. Celluma treatments are excellent when done in a series following laser! Plastic Surgery: Use prior to surgery to enhance outcome. Use after surgery to assist in healing time and increase anti-aging and skin rejuvenation benefits. Always follow physician’s recommendations. Ultherapy: Use before or after as determined by physician to aid in healing and increase anti-aging and skin rejuvenation. Excellent as a series following Ultherapy to enhance and increase benefits! Always follow physician’s recommendations. Botox and Fillers: Use to decrease chances of bruising, facilitate healing and increase anti-aging and skin rejuvenation benefits. Always follow physician’s recommendations.